Warm rays of Spring sunshine welcome you to the marina. The sky above is cobalt blue, and there’s a light breeze at the waterfront that makes a familiar sound in the mast stays of the boats. It’s the perfect start to a perfect journey. Suddenly life feels good again. You breathe more deeply. Your heart rate slows. You feel more alive. Because something tells you this is where you belong. It feels like you’re coming home, yet the journey is only just beginning. It’s a journey that can take you to beautiful river valleys, serene canals, spectacular coastlines, romantic harbours, delightful waterside restaurants and everywhere else in between. All at the quiet, unhurried pace that only motor cruising can provide. Once you‘ve tasted the experience, there’s no going back. You’ve started a love affair with the waterways. And with your boat. A love affair that the average person will never understand. This is a journey that won’t end at the next marina. It never ends. Not as long as you can still get on your boat and steer her away from the quayside. It’s a journey that will go on for the rest of your life. We know. We’re on that journey, too. Steel motoryachts of Linssen Yachts! Linssen Yachts builds steel motor yachts in its 45.000 square metre shipyard in Maasbracht, Holland. From the first sketch, development, prototyping and complete production. Everything is done in-house. A business that began life as a small boatyard in 1949 has become a market leader in the steel yacht building sector within three generations. Linssen Yachts is a byword for steel displacement yachts of superior quality and for continuous innovative product and process development. In each decade since the company was established, Linssen Yachts has been the driving force behind innovative ideas for modernising the yacht building process. And it remains so today! 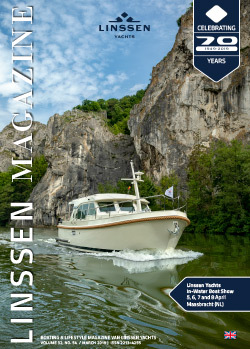 Linssen Yachts is - and remains - 100% made in the Netherlands. "Die Grundlegend weiterentwickelte dritte Generation der Grand Sturdy 500 AC Variotop, gehört zu jenen Booten, die in vielerlei Hinsicht das Prädikat « Spitzenklasse » verdienen". Enter your e-mail address below to receive our digital newsletter. The newsletter will keep you continuously updated on developments, boat shows, events, etc. Each newsletter also contains a link to unsubscribe.